Pittsburgh still managed to support one of those massive warehouse-sized record stores in the waning days of media that could be held in your hand. They shared a plaza with a post office and dwarfed the federal government. For reasons that remained elusive, you entered on the ground floor, but the public space was all upstairs. Surmounting the final step, the rows ran off into the distance. If you ventured far enough, then you discovered various audio equipment available for sampling the wares. THis was standard back in the day, but not so common outside of a couple bookstore chains who dabbled in compact discs. Besides, these actually worked and the staff was amenable to letting you listen to anything they sold. Of course, this worked in their favor. I walked out with the Waterboys, for instance. Then, there was this album with the play on words about William Blake. As it turned out, the artist had more of a folk music reputation, but what did I know? Realistically, I skimmed a few songs before buying the disc, so I did not absorb the political content. I probably had registered the artist’s name from some mentions in the music press, but had no definite associations. Ahh, naivete. Bragg has quite a bit more in common with Woody Guthrie than, say, any pop star. His politics and willingness to stand up for what he believes, as well as the wide range of musical interests, strike me as the modern setting of the dust-bowl troubadour. 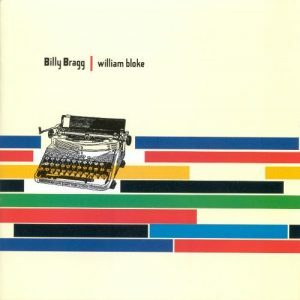 The similarities are obvious enough that Bragg was invited to collaborate with Wilco and Natalie Merchant on two albums of Guthrie’s lyrics set to their music. None of this is surprising to fans. Listening to Guthrie now can be difficult for ears trained on musical production of the past fifty years. Even early pre-electric Dylan sounds miles more polished. That’s meant as an observation. I have commented previously on the prevalence of so much work by past artists, especially as that presents a challenge to new artists. Yet, listening to the difference between Bragg with his guitar and voice compared to Guthrie with the same, it’s like listening to a Victrola. Ultimately, there may be a cut-off for just how far back we are willing to dive into the archive. Current artists may always have to take up the mantle of re-presenting older material in new fashions. Of course, that will be dependent on the continued interest in a lone voice backed by a guitar reminding us of those who have had their voice silenced elsewhere. You’ve Got to Check This Out is a blog series about music, words, and all sorts of artistic matters. It started with an explanation. 86 more to go.